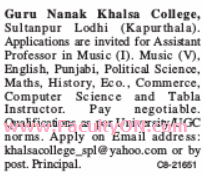 Guru Nanak Khalsa College Kapurthala has advertised in the TRIBUNE newspaper for the recruitment of Teaching Faculty- Assistant Professor jobs vacancies. Interested and eligible job aspirants are requested to apply within 21 days from 21st June 2018. Check out further more details below. About College: Guru Nanak Khalsa College was established on April 19, 1969 with an objective to spread education in this backward area,particularly for girls for whom it was difficult to reach Kapurthala for education. This college is situated near Gurudwara Hatt Sahib.The college provides peaceful academic environment to the students. College is recognized by the Punjab Govt. and is affiliated to GNDU, Amritsar. How to Apply: Interested and eligible candidates are requested to send CV, copies of certificates with recent PP size photo to the postal address given below or to the email address.